Cheese curds may be moulded either after acidification (e.g., Cheddar) or directly after cooking (e.g., Emmental). Curds of high moisture varieties mat together under their own weight but curds of low moisture cheeses must be pressed to form a homogeneous mass. The moulds used give cheese the size and shape characteristic of the variety. 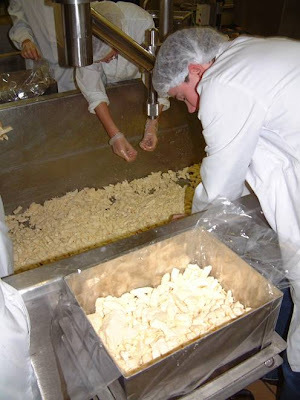 Curds (particularly those of low moisture cheeses) should be warm to ensure that they mat together, avoiding mechanical openings which are a defect in most varieties.